Let’s face it I live almost a rural life anyway. I have had chickens (now replaced with feeding cockatoos and galahs and pigeons!) , numerous cats and dogs, I have to use my own chain saw occassionally, and I can burn my own wood (preferrably if its dried out not like my fiftieth,, oh the smoke!). So I do have a semi rural existence. I was fortunate enough to rent a little place in rural France , Les Arcs sur Argents, where I convalesced a little after hurting my knee during our trip last year. Fortunately having to rest up meant lots of sketching opportunities, and since then I have been able to add a few more at home. Like many places there were some requiring a bit of work.Mind you I loved the patching up of the old buildings, the addition of new wiring was haphazard, especially for TV aerials, satellite dishes and external lighting. They don’t have to worry about mosquitoes so the shutters are for security and sunlight, there were a few times in Europe I worried about T falling out the window to bring them shut! Coming back from getting our baguettes. This was our place, (not lower apartment). three levels the balcony was above the roofing clay you can see. Had to crawl through a door1/3 size of normal to get out, not easy with unbendable knee! I banged my head every second time! This was from our bedroom window listening to ABBA music being played from somewhere below,, on and on and on…….. The fountain above was at the bottom of our one lane one way dead end street. I am unsure of its purpose but the local kids had fun in it unless their soccer ball rolled into it. The creperie was very nice. The whole place ahd a very relaxed atmosphere except when the fun run came to town. We seemed to draw fun runs/triathlons, there was one in Berlin, and Salzburg when we were there too. Our place is on the right. An ancient bell tower at the end of the street, and clock on the wall. I did try to turn car up top of the street like the locals but alas I reversed down in the end. I love line work. The function of putting the ink down on the paper gives me the most pleasure. Although adding the colours does give me satisfaction in the end , the line thrills me most. I don’t usually use pencil first. I just “go for it” with ink. Mistakes I make along the way, I live with. Although I sometimes regret my drawings of people if I make an error and can’t fix…. I am looking and noir sketches at the moment, trying to get more atmosphere in. And also adding more background, such as the characters above. The brush is handy for moving things like seagulls..
London, capitol of England, Rainy one day warm the next. The first day it was rainy, but just brought many images seen on TV of wet London (unfortunately the spooky days of a pea souper fog are apparently over…). It didnt pour on us and it didn’t inhibit our walking . It did give me memory of the walk to out hotel from Earls court to the Ibis via a real crescent. On Saturday night I was drawing cars, (as is my want), and one chap came up and said it would be faster if you used a camera. Ha haha. I just laugh now and play along but it made me think about what I am doing. I’m interpreting what I see my own way, not a perfect picture but what I see. He did say he liked what I was doing and asked if I would draw his car. I am lucky and grateful, my wife allows me time to sketch when we are at places. In Europe recently she allowed encouraged me and made me feel no need to rush. Thanks TB. I sketched all over the place. One of the advantages of going overseas is that you as the tourist are usually happy. You look around at everything and everyone, looking for new views, differences to your normal environment. One thing you notice is everywhere, is the ubiquitous eyes on screens, tablets, phones, games, laptops or screens. Even when there are friends with people, they still have their faces in the screens. It was nice to see some reading books, magazines etc, perhaps their screen things had run out of battery. And when you had too much screen time you would take three seats and sleep! The woman sitting up watching the sleeper looked as sick as…. i thought i was going to have to resuscitate her. Judgemental aren’t I? And how do you cope with going to the warm northern hemisphere when you are leaving cold Melbourne? You wear your puffy jacket and shorts! Onto the plane. The girl wanted to chat but her companion was playing games, so she grabbed her food and ate. I felt sorry for her. In LA airport I changed planes for Chicago. There was this bloke over from me wearing Pluto ears, smiling, laughing and having a good time. Although I was surrounded by eateries and bars with sport on all the screens, this bloke kept my attention, so i drew him. I couldn’t see the plane so people sketching it had to be. Here is the A380 I caught (yeah someone threw it to me….oldie but a goodee) from melbourne. Like Melbourne, Chicago was swapped from the first peoples. Not only did they both lose their “rights” they were moved off by the newcomers…….. It appears the Native Americans called the area ‘shikaakwa’ which may have meant smelly skunk, or smelly onion (which they now call ramps?). And the French explorer Robert de La Salle translated to Checagou. We have “onion weed” here, I wonder if it is the same thing? Twinkies are not a huge thing over her. Sure I have heard of them and even tasted one and thought, “gee how did this survive the trip and still be ‘edible’?”. I found it interesting the original filling was banana flavoured! I have booked a few things in Chicago to do first up, dot he tilt on The 360″ view . I’m not so worried about the wind of the windy city. I have also learnt it was called the Windy City because the people from other states of the US felt Chicago bragged about itself so much. Seems fair enough that they bragged about their city. The way it grew, then aftet he city destroying fire grew up again. But I was going to put string on my hat to keep it on when the wind came from the prairies. 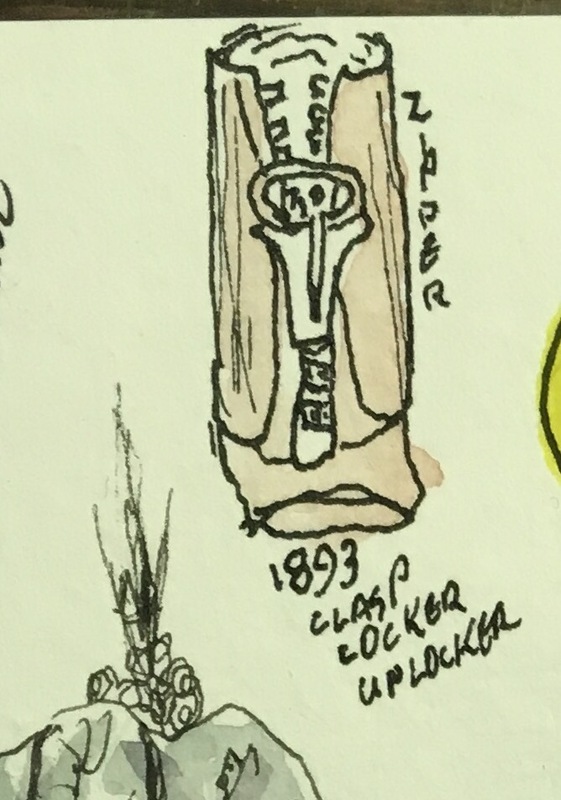 But the bragging worked, they got the Columbian Exposition, where the first successful zipper was released, even if poorly drawn. More wind would alos have been produced through blowing bubbles in Chewing gum. Didn’t everyone start chewy with juicy fruit (or as I drew juicy frutt!)? Then you grow up and try PK. I nearly forgot the And I am also looking forward to going to watch the baseball at Wrigley stadium. I nearly forgot about the spearmint sticks wrapped in alfoil. and then the kids who tried to trick you with the fake chewy packs with the mouse trap like contraption that hit your finger when you pulled it out……. 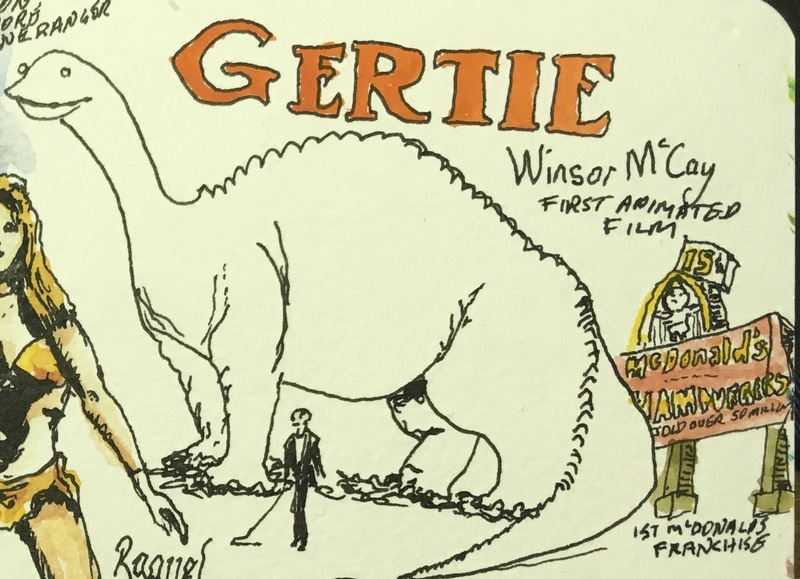 Although I could have drawn Walt Disney, but the first animated film was Gertie the dinosaur, by Winsor McCay a silent film you can see on the internet, and compare my drawing… although it looks dated you have to remember it was revolutionary and is highly regarded by the people who came afterwards. Also Chicago was the place of the first McDonalds franchise. NOT the first store…. I grew up with only 5 TV stations, Donald O’Connor (from Chicago) was always on (OK…often…) when the movies were showing, on weekends or during the week when I was sick at home as a kid or no school was on etc. I loved his humour, non offensive, he wasnt the lead good looking guy but I still related to him. Another TV icon from Chicago was Raquel Welch. My dad loved her so if she was on , we saw her…..He also loved the Lone Ranger……..
Bob Newhart was also a comedian I related to, he didnt have to be rude, oftne he didnt need another actor. His driving instructor sketch is one his more famous. Harrison Ford is also from Chicago. I am a huge fan, Star wars, Indianna Jones, Blade Runner and I can’t read a Tom Clancy “Jack Ryan” book without seeing Harrison in the role. Down the bottom left of the above page I drew quickly the “Raising of the City”. Now I think of it as Reblocking but instead of reblocking your house they raised WHOLE buildings, at times with people in it ……They had hundreds of workers helping to slowly rise feet off ground (below water ) level, while they tried to reorganise the cities drainage, sewrage etc. in 1857!!!!! 2 months 7 days……..until I fly in. 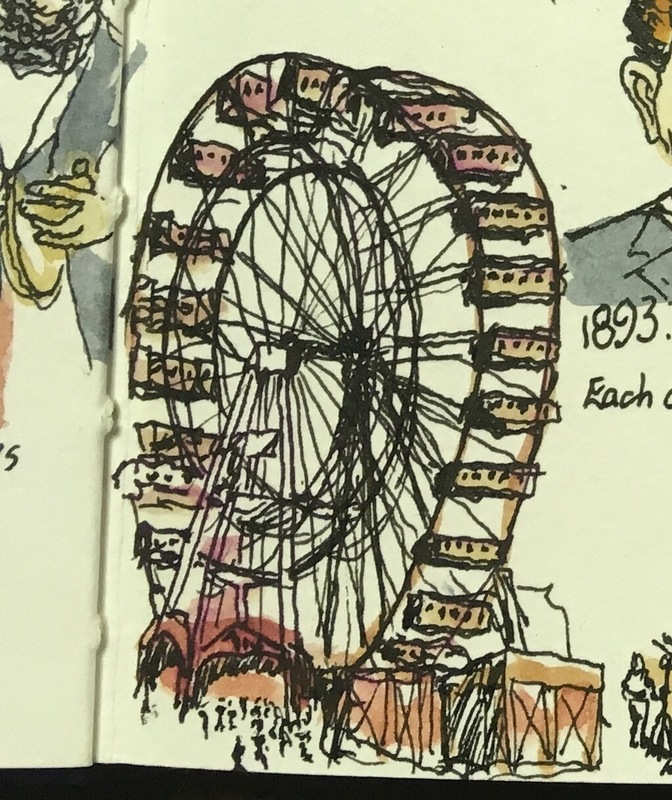 Later in the year I am off to Chicago & New York for the Urban sketchers Symposium. I knew very little about Chicago. I knew there was a major fire, they have an elevated rail, they are on a lake….. and the music scene, autos etc. so I have been reading Donald L Mille’s book city of the century, the making of Chicago, first 100 years. 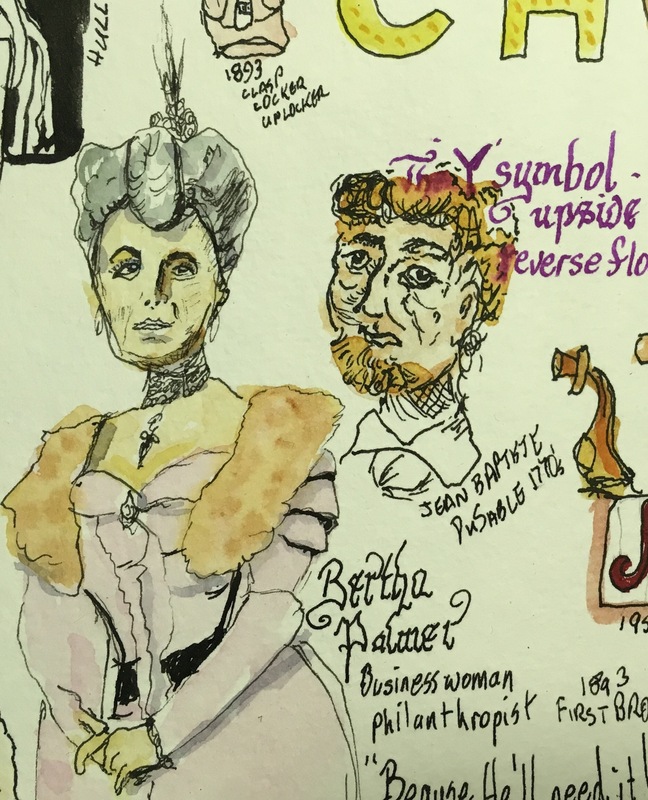 Certainly a go getter place with many firsts, with a bevy of people who came and made their mark on a frontier town which grew into the symposium hosts (and a lot more). It’s a grid city just like Melbourne, so it’s nice to compare the layout to my capital. 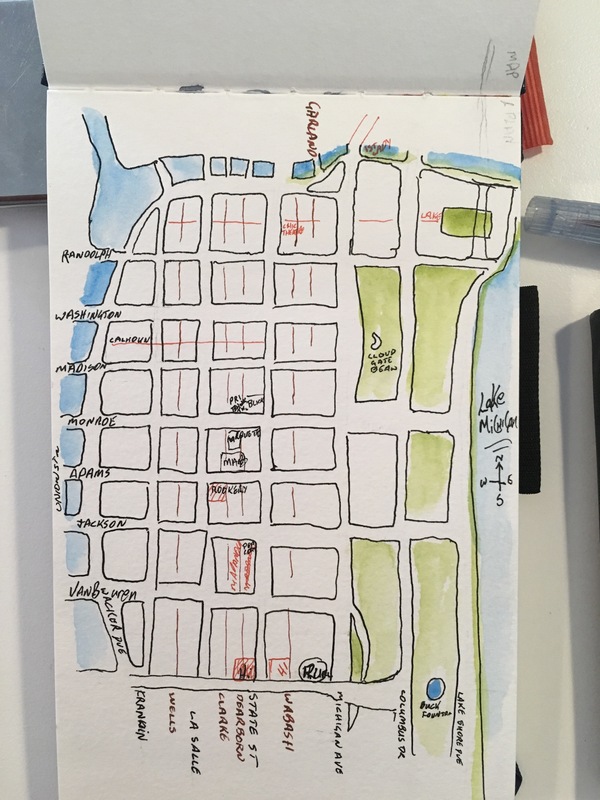 I have sketched a few of the personalites, the grid city and a few other things that have tickled my fancy about Chicago. I am going to mark the map where I have been during my trip, although I will still get a few maps when I’m there. It looks like I’ll be around the “loop” for most of the time. But what of chicago have I noted. Quite a few firsts, including sky scrapers and the use of concrete over metal to strengthen it . The Pullman carriages, I thought were whole trains but they only built carriages…and strangely a town. 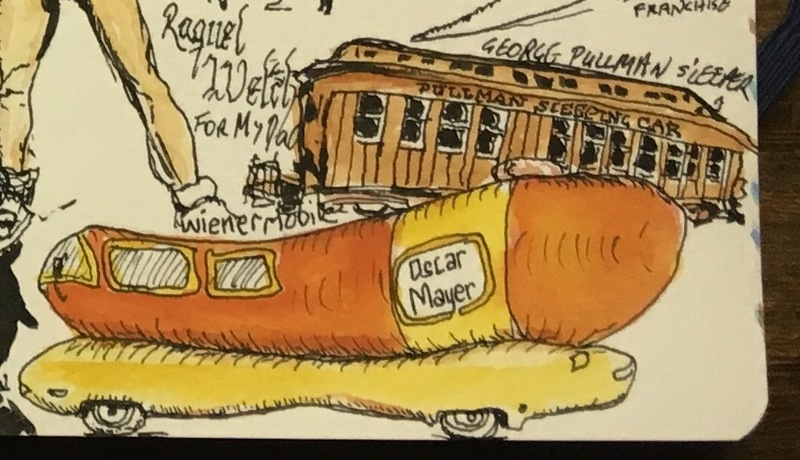 Sounds like George Pullman was bit of a control freak, I think he meant well but….. so here’s a quick sketch of him from a photo. 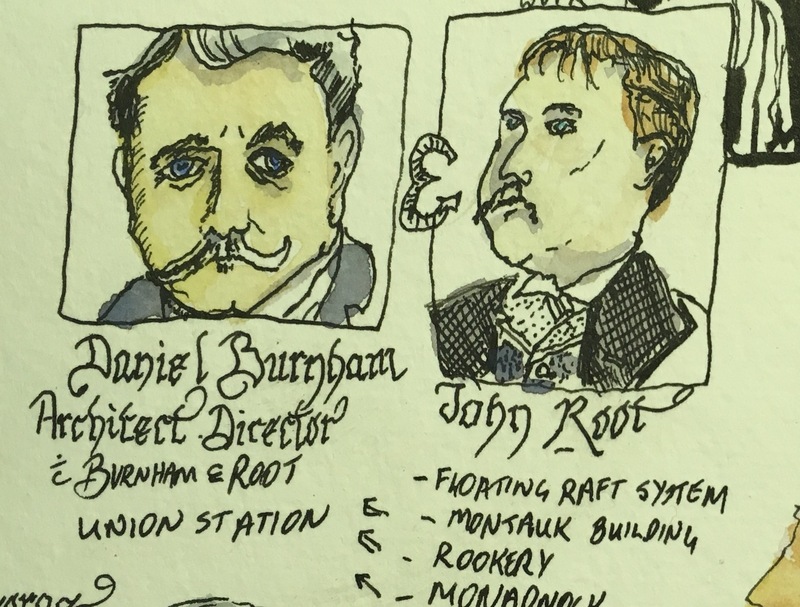 Burnham & Root were involved in building the first skyscrapers and then Burnham ran the Columbian exposition, and then died I quickly after…. it was called the Columbian for the 400th anniversary of Christopher Columbus’ discovery. The elevator was shown to be safe at the expo by Mr Otis. and sales took off allowing skyscrapers to be built as they were now scalable. Root and Burnham considered the first skyscraper architects. Looking forward to seeing the buildings of theirs that are still there. The first Ferris wheel was built for the expo. And melted down later…….each car held 60 people. Still the worlds largest Ferris wheel ever built! The first ever Ferris wheel, built by a young Ferris, to rival the Eiffel Tower, made with similar amount of metal. Many women were involved in the development of Chicago ( later in the 1800s), as business women and philanthropists. I loved this pic and had to draw it of Bertha who some called the socialite queen of the expo. She also had the first ever “brownies” made for her to entertain guests. The Pullman sleeping carriage was a first which went from Chicago to the world. Melbourne had 3 Pullman carriages for the southern aurora, but they were too heavy and were kept at Newport workshop in storage for years. There is a heck of a lot more so more later.